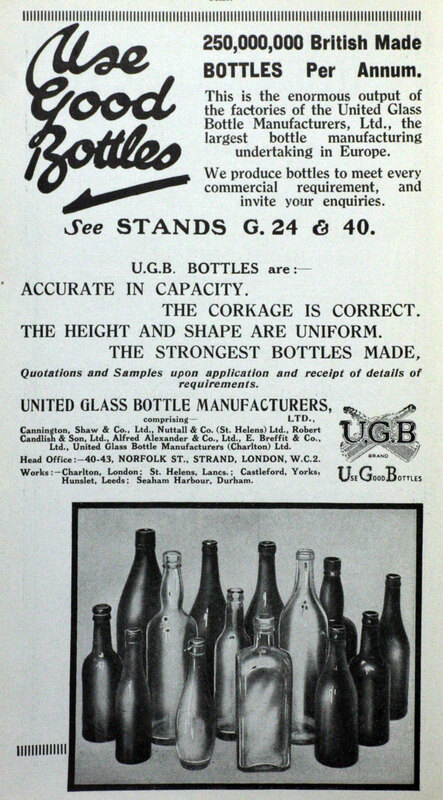 1913 Formed as a public company named The United Glass Bottle Manufacturers Ltd, when Ravenhead Glass, Cannington, Shaw and Co, Nuttall Co, Alfred Alexander and Co and Robert Candlish and Son combined, in order to raise sufficient capital to acquire rights in the first successful automatic bottle making machine which had been invented by Michael Owens, the founder of Owens- Illinois Inc. The company closed some smaller plants and concentrated its production at a newly built factory at Charlton and two factories in St. Helens. 1923 Acquired a majority interest in Kork 'N Seal and the remainder in 1955. 1925 The shares owned by British Glass Industries were sold to a third party. 1937 They acquired four bottle manufacturers from the Distillers Co.
WWII Established a second closure-making company at Bridge of Allan. 1955 Acquired Alloa Glass Works Co.
1959 Started manufacture of plastic bottles through their subsidiary United Glass (Thermoplastics). This page was last edited on 10 July 2013, at 10:11.